We are well offshore in Mexican waters, kayaking in an area known for sharks. There are plenty of blues and makos, and even bigger predators known to stalk these waters. We know we have a good chance of spotting the unusual ocean sunfish, aka the mola, as they’re in season. But we also know we are exploring an area directly in the path of the blue whale migration. It's turned into an impromptu DPG reunion, organized by Keri Wilk, with Matt Weiss making a rare appearance, and the two of them convincing me to tag along. I’m filming for DocumentaryTrips.com, my new company offering epic overland, scuba trips, and video workshops. This trip is an experiment to see what wildlife we might be able to film here and figure out how to manage a video camera rig in and out of motorboats and kayaks. It’s also a nice change of pace after years of intense documentary work at Discovery Channel in Canada, and before that as a freelancer. 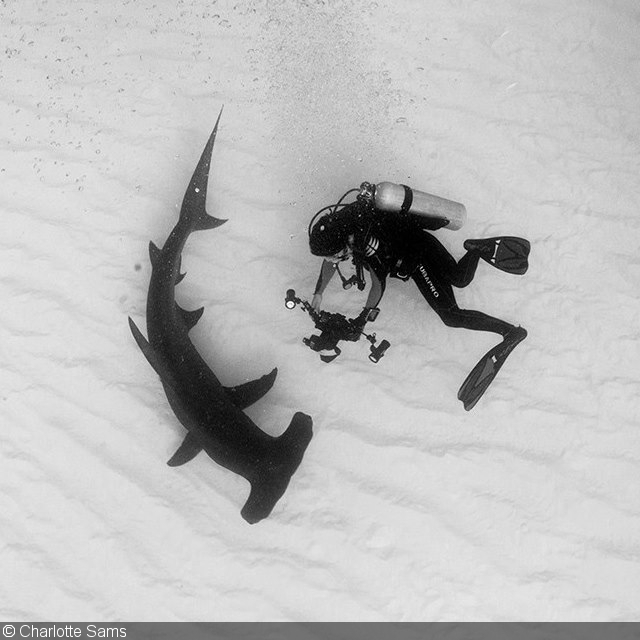 Throughout that time, I’ve had some truly privileged moments topside with bears and wolves, and underwater with hammerhead sharks, whale sharks and even crocodiles. But what I capture on this trip is beyond what I would’ve allowed myself to dream. Beyond my most selfish prayers. A shark fin is spotted and I cautiously pop in for a look. “Actually, it scared me a little,” says Rob, my kayak guide. “I told you already, but this is the only place where I’ve seen great whites around here.” Again, I have no luck, and see nothing. Or is that good luck? A couple days pass like this, with next to nothing, zero. When we see a whale’s blow off in the distance, I keep realistic. We steer towards it for a closer look. We don’t actually think we can catch up to it, and sure enough, the huge beast eases into the blue and is gone from sight. Then again, another blow at the surface. Then a tail in the distance. We now realize we are in the midst of three or four blue whales, all of which are likely feeding in the deep ocean trenches far below us. In the distance, I see Keri, way ahead as always. 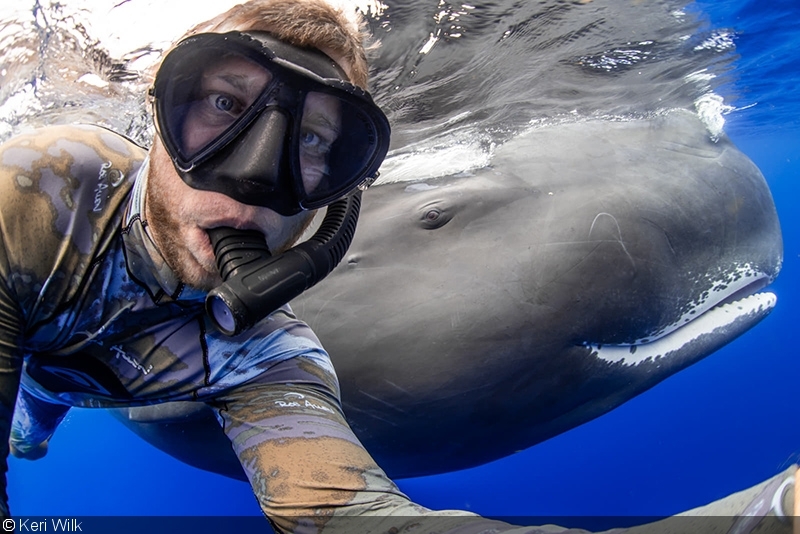 A whale emerges just behind him. “It looks like Keri dropped!” shouts Matt from his kayak. These are the true blue whales and not the smaller pygmy subspecies that has been filmed often in recent years. These animals are so large it is difficult to comprehend. It’s the King Kong and Godzilla effect, where the giants seem to be moving in slow motion, but you’d never be able to catch them. They seem so close, but always far out of reach. Naturally, Keri comes back with some killer shots. Till this point, I've filmed one mola, heard rumor of a shark, and spotted a few whales from the surface. It’s been one of those trips where you begin to contemplate your life’s choices. Paddling far offshore, under a baking sun and completely at the mercy of the rhythm of the waves. Your mind starts to go after a while. I start praying to the whale gods and singing deep in my chest for some reason. I’m not a religious person, but I drift in and out of full meditative modes, throat singing like a whale hippy as time rocks me gently insane. After hours, or days, a blow in the distance seems to indicate a whale headed roughly in our direction. My gaze snaps into focus. I slip into the water. Keri moves to the right, so I move left. Matt is nowhere to be seen. I swim hard and then wait and stare out into the blue. I see the shadows in the deep again. How much time has passed? I am certain I missed my chance. Surely the animals have already passed us by. I lift my head out of the water and look for some guidance from Rob. He’s gesturing wildly. I plunge my face back in the water, look to my right, and there is a massive shadow headed toward me. Never in my life have I felt such a rush of adrenaline—it is nearly all-consuming. Trembling, I hit RECORD on my camera. The blue whale is upon me, already at the surface taking a breath just 30 feet away. I am struck by a number of things. First, its enormous head looks so flat at first, it’s strange. And its skin is so reflective underwater that controlling the image is tough. I thought myself clever to preset exposure, but I can immediately tell I am going to be over. I dial down the aperture at least a full stop upon first glimpse. I know this might ruin the beginning of the clip, but it will save the rest of the shot. As it approaches, the whale begins to angle a bit away from me. It knows I am here. Its “nose” is darkish, but its back shimmers like a mirror. The light bounces and illuminates the water and plankton. The effect—as if it isn’t magical enough already—is to give the whale a full-body halo. I’m tempted to stop down again, but cooler heads prevail. It dives downwards, cruising past not 15 feet from me at this point. I try my best to film the events despite fighting the surge, soaked in adrenaline and in complete awe. I remember—barely—to let the animal swim into frame, follow the eye as much as I can, before holding the frame steady, and allowing the animal to ease out of the center. I resist the temptation to track back to the tail, but it takes all my will power to stay focused on composition as the scene unfolding before me is beyond my comprehension. Fortunately, I am filming with the widest possible lens, a fisheye. This allows me to capture the full animal despite it being so close. The length of this animal is really something to behold. A silent freight train cruising past, the whale is at least 70 feet long, but it’s so hard to say. It’s all over in just 18 seconds, but consider that for a moment. When most animals run by you, they’re gone in an instant. This behemoth just keeps going, long after its face is gone from view. And I relish every second: My lifelong obsession with wildlife and my career both peaking in a few ticks of the clock. With prayers answered, I may have found my new religion. That was my holy grail, a blessing beyond all imagination. About Diego Garcia: At the age of 24, Diego was handed an underwater camera and whisked away on a 10-episode travel show across Southeast Asia. 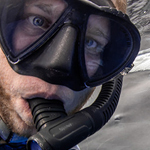 Now with 15 years experience, his work topside as a producer and as an underwater cameraman has appeared on Discovery Channel (e.g., Shark Week), National Geographic, Crime & Investigation (AETN), Channel News Asia, and more. He recently launched DocumentaryTrips.com, a video workshop experience currently offered in Bali, Costa Rica and Sri Lanka. Diego is a DPG Field Editor. Join Diego on his next trip to film marine mammals in Sri Lanka. About Keri Wilk: Keri Wilk started diving at around 8 and was certified by the age of 12. 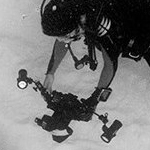 Around two decades have now passed since he picked up his first underwater camera. With his brother, a fellow engineer, Keri co-owns ReefNet, which creates products that benefit the underwater world, such as optics, data recorders, and marine life ID guides. After winning over 100 awards in international photo competitions, he now regularly appears on judging panels. Join Keri on expedition in Baja next June to photograph sea lions, Mola mola, sharks, and blue whales.